All transactions are safe and secure with a reliable history in online purchasing behind each of our associates. 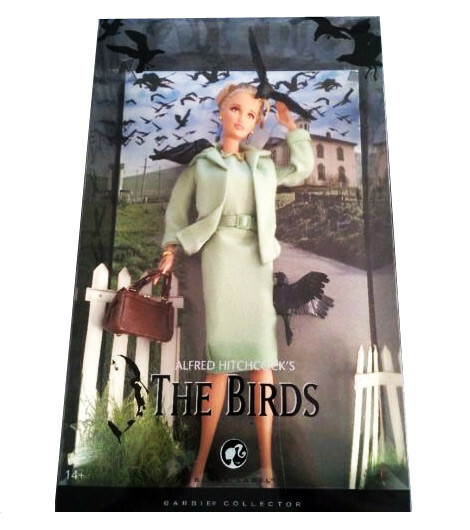 Buy the Tippi Hedren Birds Costume Barbie to own Alfred Hitchcock clothing and merchandise. It doesn't matter if you live in Bodega Bay or not, this Tippi Hedren Birds costume Barbie will be admired by everyone you come across. Most people would agree that after watching The Birds movie, there is no way to look at birds the same way ever again. Hitch was a genius. If you would like to pay tribute to his work and want to create an Alfred Hitchcock costume theme for you and your significant other, then don't miss the Norman Bates Psycho mother costume in the gallery. The pairing would make a killer match! In addition to the Tippi Hedren Birds Costume Barbie above, browse the Alfred Hitchcock Clothing Gallery for more apparel like men's and women's clothes, kids shirts or hoodies.